The Eyelash Viper (or, the Eyelash Pit Viper) is a tropical snake that is distributed in a small part of the continent of South America, as well as Central America. 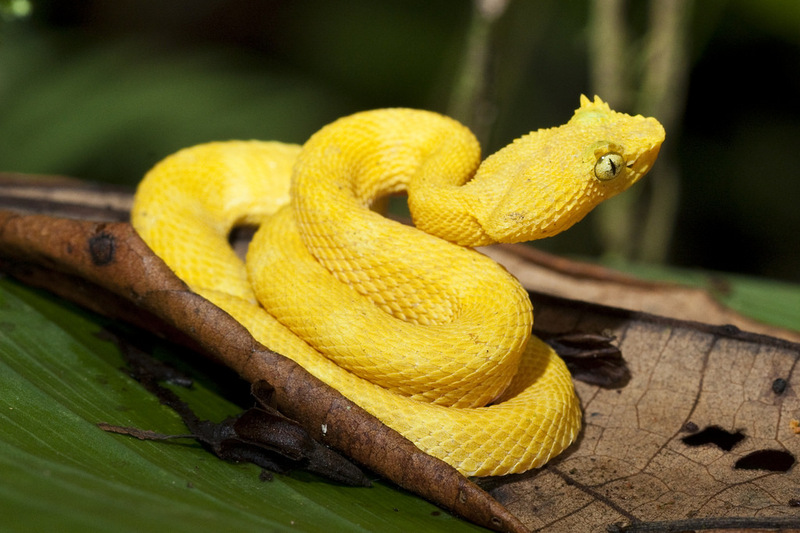 These are highly venomous creatures and are considered as one of the most beautiful viper species on the world. Size: Males range from 55–82 cm (22–32 in) in length and the females can be up to 69 cm (27 in). Weight: The weight of these reptiles can be anything between 4.5 and 6.8kg (10-15lbs). Body: These vipers are found in green, yellow, reddish brown, golden and many other color combinations. Teeth/Fangs: Two fangs are hidden inwards on both sides of the jaw that are used to bite, capture prey and inject venom. Sexual Dimorphism: The females are larger than the males. Approximately, they live for up to 10 years in the wild. They range from Chiapas in Mexico to the northwestern regions of Ecuador and western part of Venezuela. They are also found in parts of Central and northern South America including Columbia, Ecuador, Venezuela, Peru, Costa Rica, and Panama. 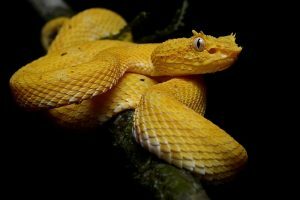 Presently, no regional subspecies of this viper have been recognized. Terrestrial Biomes usually include rainforests or even general forest areas including wooded or shrubby habitats, as well as agricultural lands, moist lowlands, and mountain foothills. 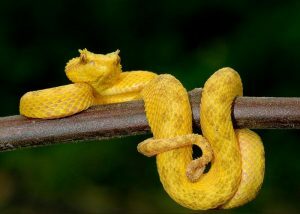 Like most other pit viper species, these are nocturnal creatures and usually spend a solitary life. However, they have been noticed to come back to sites they are familiar with, in order to keep track of the migration pattern of their prey animals. 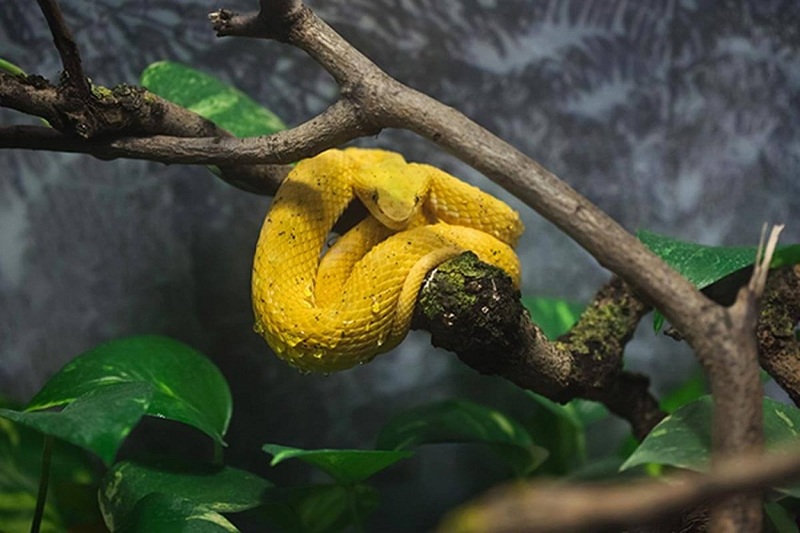 These snakes mostly live in treetops and camouflage themselves behind the leaves. When thirsty, they drink water from the droplets collected in the tree and wait there to hunt down their prey, if found. Just like all other pit vipers, this species also has two pits positioned in between their nostrils and eyes. These organs are sensitive to heat and can track down their prey, as well as their enemies easily by the heat emitted from their bodies. Thus, they depend entirely on “heat imaging” to keep track of their environment. 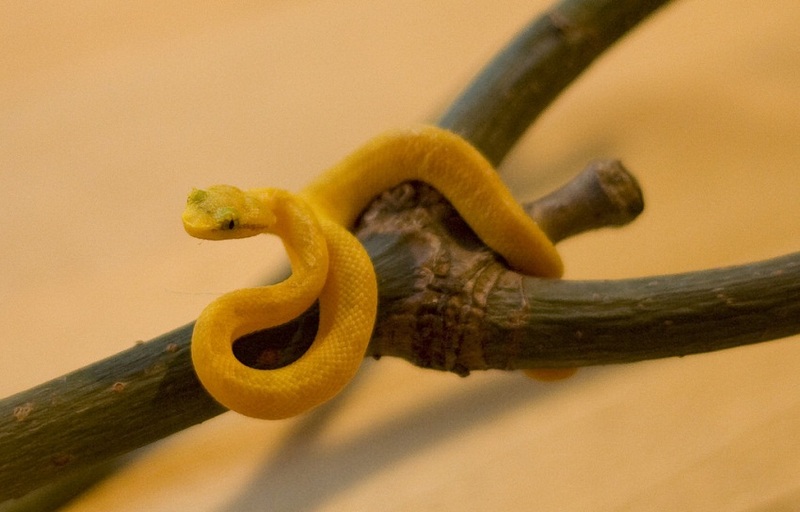 Like most other snake species, they keep their long flicking in and out for sensing chemical changes in the air. The eyelash vipers usually prey upon small animals that are easy to capture without confrontation. 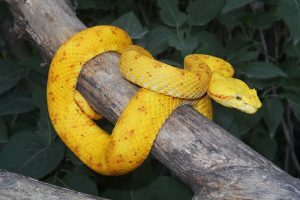 Though they are not an aggressive species, they would not take time to bite human beings that come too close to them. The snakes prey upon particularly small birds, amphibians especially frogs, reptiles, nestlings, and lizards. These reptiles reach the age of sexual maturity when they are about two years old. Using their keen sense of smell, they locate their mates and display courtship behavior, which is an integral part of their mating rituals. Initially, two males get engaged in a dancing stance called the “dance of the adders” facing each other in an upright manner similar to a cobra. 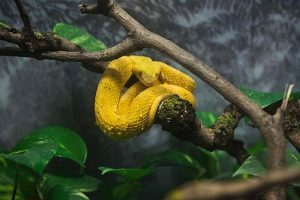 The time of mating of these vipers is usually after sunset, and they reproduce round the year when the temperature is warm. After the act of copulation, the lower abdomen of the pregnant females look enlarged. Quite often, the females refrain from feeding during the advanced stage of pregnancy, while they incubate their eggs inside their wombs after a gestation period of about six months, which technically means, they are ‘ovoviviparous’. They typically give birth to 2 to 20 babies per brood. 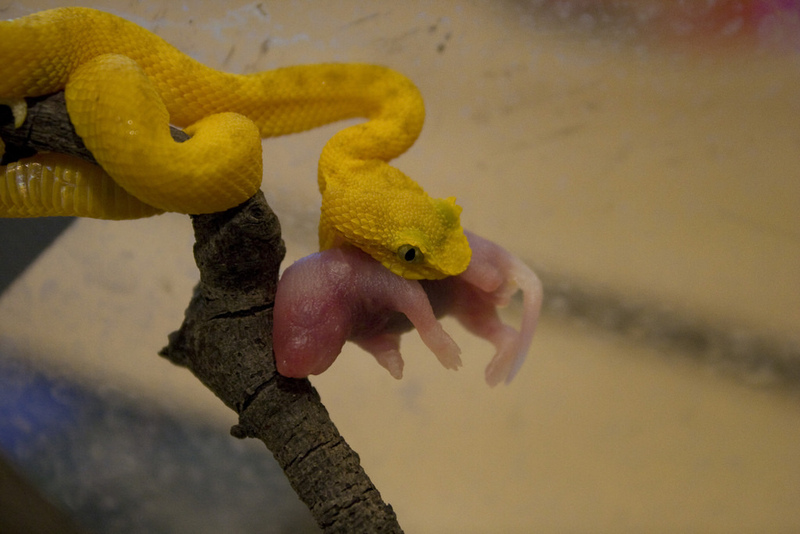 While inside their mother’s body, the baby snakes begin getting developed till the primary stage before they come out as live young. When born, the juveniles are between 15 and 20 cm and look similar to their adult counterparts (except for size). 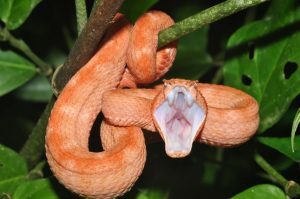 After the baby snakes are born, the female spends very little time to take care of the young ones since they are already equipped to be independent. 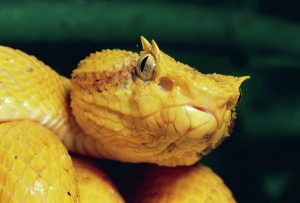 Eyelash vipers have a robust binocular vision, while their pupils are slit vertically as an adaptation technique to increase their visual perception. 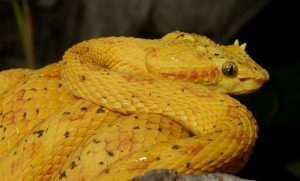 The body color primarily varies on their surroundings and habitat, e.g., yellowish individuals camouflage in the ripe bananas, whereas the green vipers hide amidst vegetation. 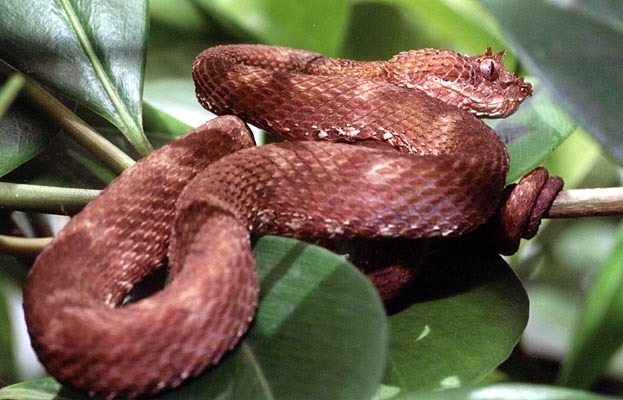 The tan or reddish-brown ones camouflage from enemies in tree barks or brown and red flowers. The scales on the body of these arboreal reptilians are coarse or rough, which help them in clinging to the tree branches in their habitats. Their primary enemies are bigger mammals, badgers, foxes, hedgehogs, other larger snakes and fish, different birds of prey, and even humans. These serpents have not yet been classified or categorized by the IUCN 3.1 Red List. 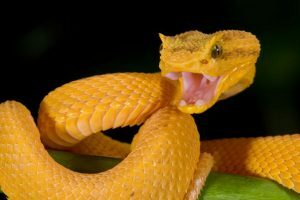 The eyelash viper gets its common name from the set of modified scales just above their pair of eyes that resemble eyelashes. 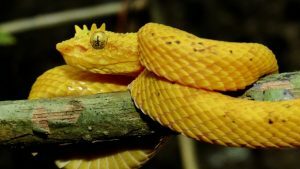 Unlike most other vipers, this is a species that is known by many common names including eyelash pit viper, Schlegel’s pit viper, Schlegel’s viper, Schlegel’s palm viper, eyelash palm viper, eyelash palm-pitviper, eyelash lancehead, horned palm viper, eyelash snake, and eyelash mountain viper. 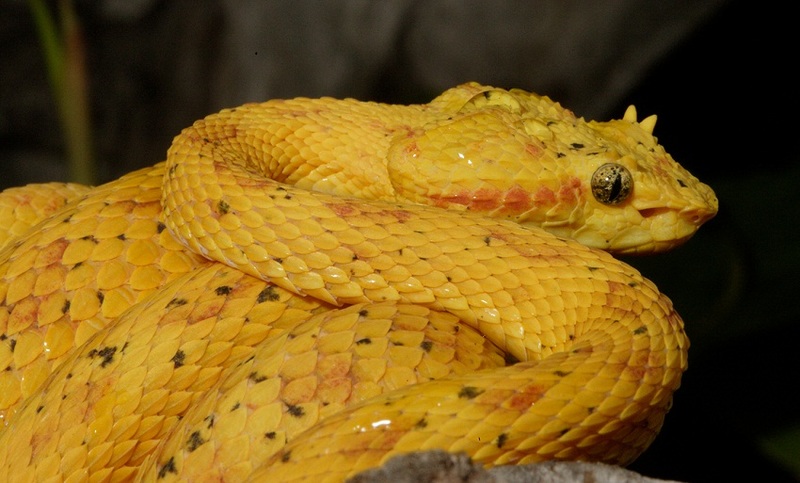 Eyelash vipers have been accidentally sent in different parts of the world through shipments of bananas.